Yes, that’s right, a unicorn. That mythical, magical creature of fairy tales. I used to tell granddaughter Eleanor a (long-running) story about an old cart horse called Jerome who was able to turn into a unicorn every time Eleanor wanted to fly over the rainbow. As you do. My unicorn was in the shape of a simply delicious birthday cake, lovingly chosen for me by my Trio of Rampaging Rascals. The Youngest of the Darling Daughters said she was quite prepared to bake me a cake but her sister, Middle of the Darling Daughters and mother of the Trio, felt sure that her littl’uns would be able to choose the perfect cake for the occasion. And as you know you can’t argue with a unicorn, can you? The Trio don’t believe in keeping secrets so I was told on their arrival (by Faris) that there was to be a cake. Ah, well, I thought, it will still be a surprise. But: “It’s a unicorn!” Tala confided. Now that’s what you call a surprise. It isn’t my actual birthday until Wednesday but all those members of the family who were able, not being (i) too far away or (ii) revising madly for important exams, gathered at our house for pre-birthday celebrations. The weather was on our side so we were able to spend the afternoon in the garden where Mr B joined us, having braved the terror of being wheeled by his daughters down the portable ramp. As well as the Trio, granddaughter Hazel Bagel was there, which was definitely A Good Thing as she was able to put the small people through their paces - think ballet, gymnastics, press-ups and skipping round the garden - which kept all three busy and made the rest of us feel worn-out just watching them. My contribution to the fun activities was two-fold. Firstly I taught Faris the basic principles of orienteering, having found an old compass in a drawer. I think it may have belonged to one of the Darling Daughters in their Guiding days. The compass, I mean, not the drawer, don’t be silly. “Good luck with that!” his mother commented, when I explained what I was planning to do - but Faris hasn’t watched Andy’s Dinosaur Adventures on TV for nothing. He was well up for a bit of exploration, once we’d covered the basics of North, South, East and West. So delighted was he with his progress, that he is going to report it as his “Wow!” moment at school today. I like the idea of “wow” moments, I am planning to have many more of them over the next year of my life. My second contribution was to introduce the Trio to play-acting with the help of The Tweenies. I own all the main characters, including Doodles the dog. My (Not So Very Little) Welsh Boys used to love acting out all the Tweenies stories when they were still Little Welsh Boys. On one occasion, I remember, they asked me to turn the dolls into “proper” puppets, by adding strings to their heads. Their father, My Boy, pointed out (with some justification) that this looked as if I had personally killed off by strangulation some of the best-loved characters on children’s television. Our picnic meal (remember, I was instructed not to lift a finger) was delicious and I was toasted in Prosecco. 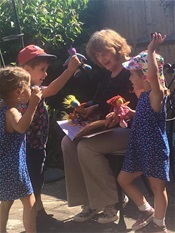 The Trio insisted on helping me open my birthday presents, excited by the sheer size of my parcel, though they were a little disappointed that we were not going to play Pass the Parcel, which is, of course, de rigueur at all the very best birthday parties. It was a good thing that, after all the excitement of yesterday, I had more to look forward to today when Mr B and I celebrated our fifty-second wedding anniversary with a lovely lunch out, followed by a pleasant afternoon watching the film, Coco, which was one of my birthday presents. I won’t spoil the story for you, if you haven’t seen Coco as yet, but it is all about the way we weave memories by which our children and grandchildren will remember us when we finally kick the proverbial bucket. My grandchildren will presumably tell their grandchildren, among other scandalous stories, the tale of how I once strangled The Tweenies.